The Trilobite maze closes November 12 -- don't miss your chance to experience it! Want to know more about Trilobites? 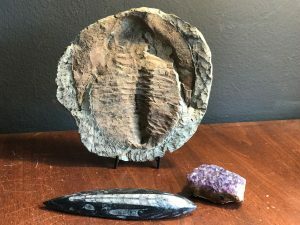 Breaking news: Lodi, Wisconsin farmer unearths the largest trilobite ever found! Trilobites, which were sea creatures related to modern day horseshoe crabs and spiders, last lived in Wisconsin more than 250 million years ago. These adorable monsters lived long before the dinosaurs, and are often found as fossils. To date, the largest trilobite fossil ever found was about 28 inches long. The public is invited to investigate the corn maze trilobite on fall weekends starting on Labor Day weekend. The maze is open through the 2nd weekend in November. 15 acres–that’s nearly 15 football fields of corn! Before we started to plan the 2017 corn maze, we were contacted by the UW-Madison Geology Museum folks, RIch Slaughter and Brooke Norsted. 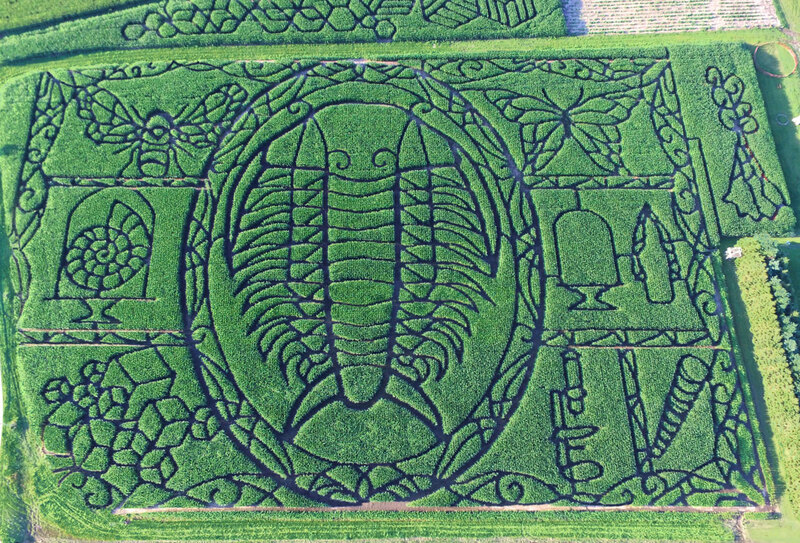 They suggested doing a trilobite corn maze–and they were pretty persuasive. We talked a lot about making a trilobite the main image in the maze, and having a sort of geology-ish theme, and then having a lot of fun education and engagement opportunities. I was basically sold when they showed me their trilobite temporary tattoos. So, we were committed to doing a trilobite very early on in the design process. The trilobite was a challenge, though, because a fairly significant proportion of people have never heard of a trilobite. And I was concerned that photos of the maze might be confusing as well. We prefer that people can easily see what the maze is supposed to be when they see the photo. I struggled over this maze design for a lot longer than usual. I just couldn’t see a way to make the trilobite the main figure and the other geology and science-related imagery make sense. 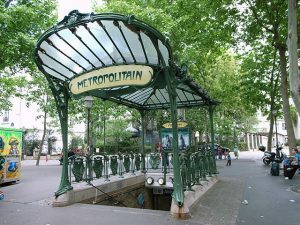 Everything started to come together when I settled on an art nouveau style for the design. 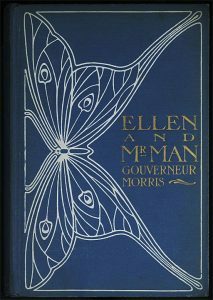 In a number of the earlier mazes (the dragonfly, the mermaid, Icarus) I’d used a Tiffany stained glass-esque style, and that started to get old. I decided that each year I would pick a different style. For instance, I used a folk art style inspired by linocut designs for The Fox and Grapes maze, and a Japanese Kawaii (“cute”) style for the Killer Baby Unicorn in 2016. The art nouveau style is perfect for our maze because of all the organic forms, like vines and tendrils and all kinds of swirling lines–perfect for getting lost in! 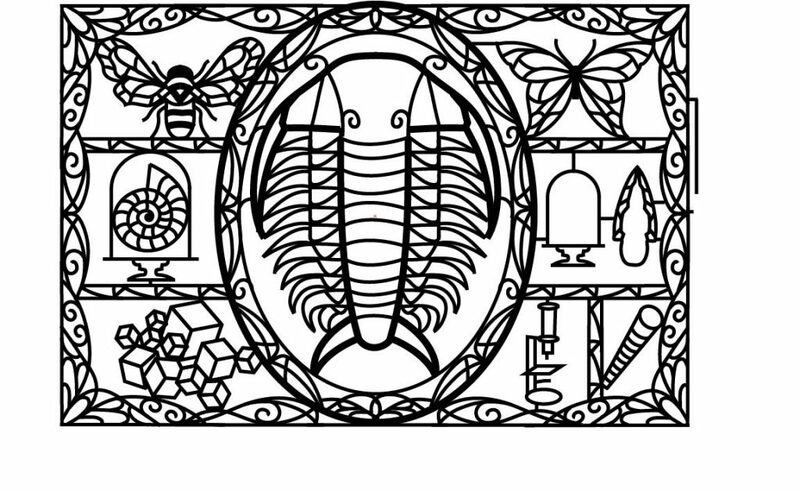 And trying out curving fretwork as a border gave me the idea to put the trilobite in a cabinet. A Cabinet of Curiosities, of course. Perfect for our maze theme! 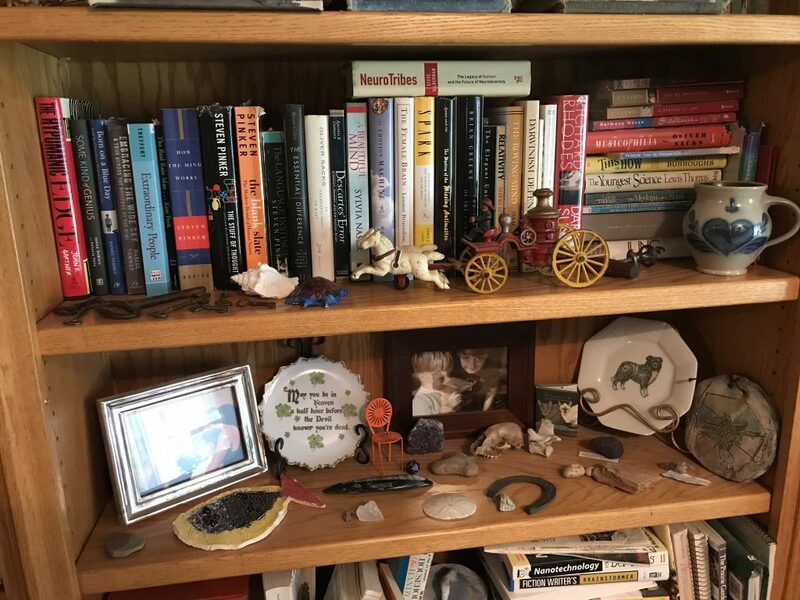 We already had “Shelves of Curiosities” in our library here at the Treinen Farm, so it was simple to use an Art Nouveau cabinet design to contain the various preserved specimens in our Trilobite Maze Design.